Bio: The first of a six part specialization on ruby on rails, this course is a very basic introduction that takes place over three weeks. The first week has students set up their development environment, second week they teach ruby syntax and usage, while the third week covers rails and a few other third party tools and libraries. 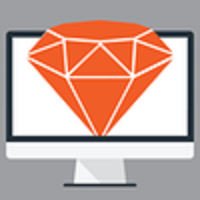 The course does offer a good number of self graded programing exercises for teaching the ruby language, however something about the pacing of the course feels off. Lectures cover topics such as git, blackbox testing, heroku, HTTParty, and some other rails conventions that they never actually use in the assignment assessments. The week two assignment to create a modified word frequency function was a bit to hand holdy. While the week three assignment, which uses a third party API to create a web page that searches for cooking recipes by ingredients, gave very little direction. You end up having to go to sources outside the course in order to learn rails. The worst part is that the third party API required for the final assignment went down for days at a time during the course period, making it impossible to debug or run the program. Overall, while the course is an ok beginner class for ruby programming, it really only introduces students to rails concepts rather than teaching them anything about it. This entry was posted in CourseReview, Programing and tagged Coursera, CourseReview, Proggraming, Rails, Ruby. Bookmark the permalink.